Sculpture Size: 16.5 X 12 X 32 in. The large panther was originally part of a life size sculpture from the idea of the stone lithograph, The Letter. But the cat took on a life of her own as she sat in the corner of the studio while I worked on the angel figure. While still in clay, people entering the studio, would go directly to her, pat her head, and tell her how beautiful she was…hence her name, Bella. She is both protector and companion to the angel. And on her own she represents those qualities to everyone who sees her. 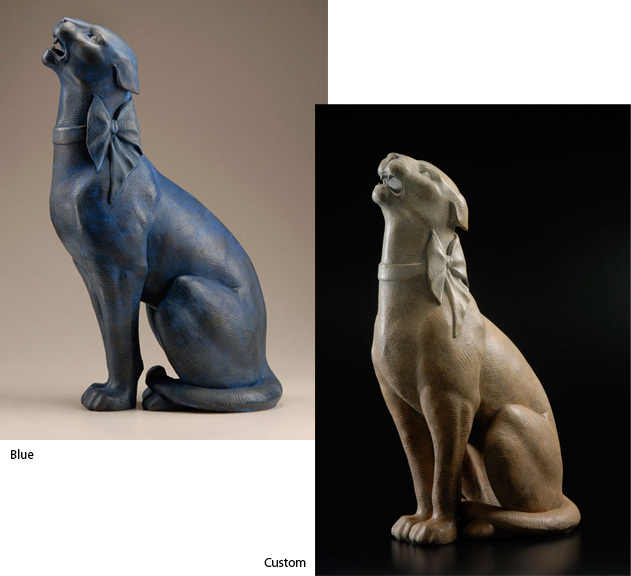 My original choice for her color in the big sculpture was dark blue and that is why we also have Bella Blue.